the new version just feels like a native Vista application and all that entails including richness, transparencies, and very powerful reflow features. Since this is only a preview release, many features are intentionally left out, but the good news is that you can run both Yahoo! 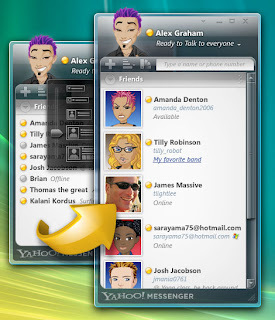 Messenger 8.1 or 9.0 and Messenger for Vista on your PC depending on what you need. If this caught your interest, just go ahead and download Yahoo! Messenger for Vista! Oricum un feature adaugat care mi se pare bun si de aprofundat este ala cu ferestrele "imploded".